Feedback: 15 comments - leave yours! 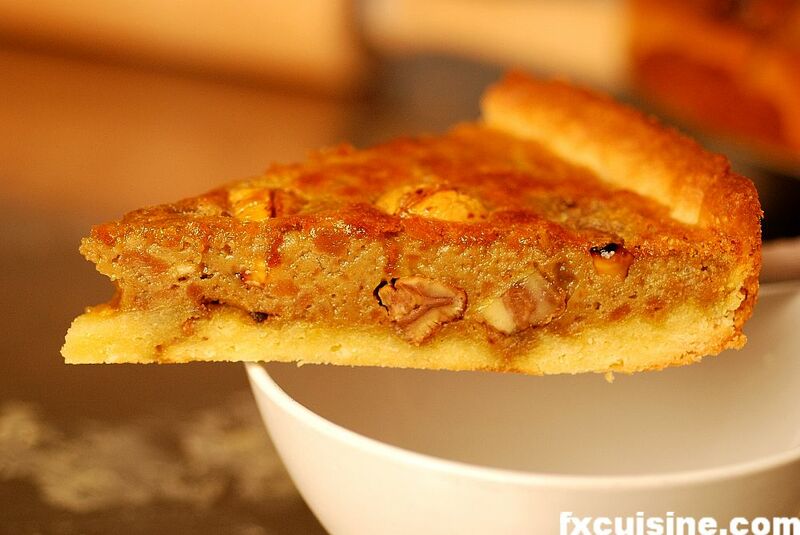 The most sophisticated chestnut pie in the world. This pie took me almost 3 hours to make. 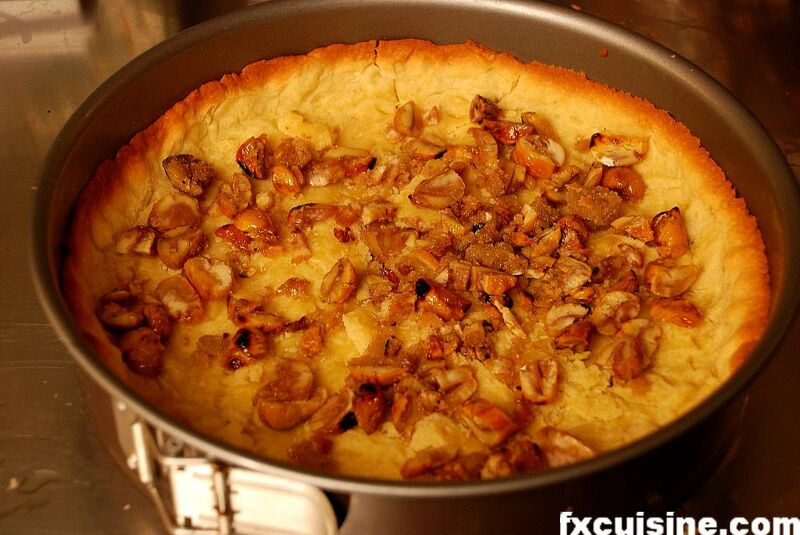 I got the recipe from the divine Pierre Hermé, who got it from Régis Marcon. 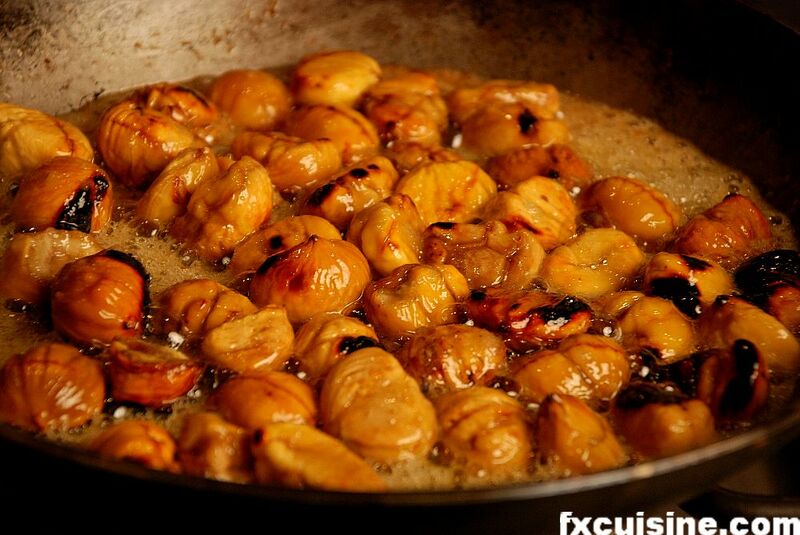 My contribution is using street-bought roasted chestnut for added flavor rather than the regular dry-cooked chestnuts. A very impressive dessert indeed. Peel the chestnut and measure out 300gr. 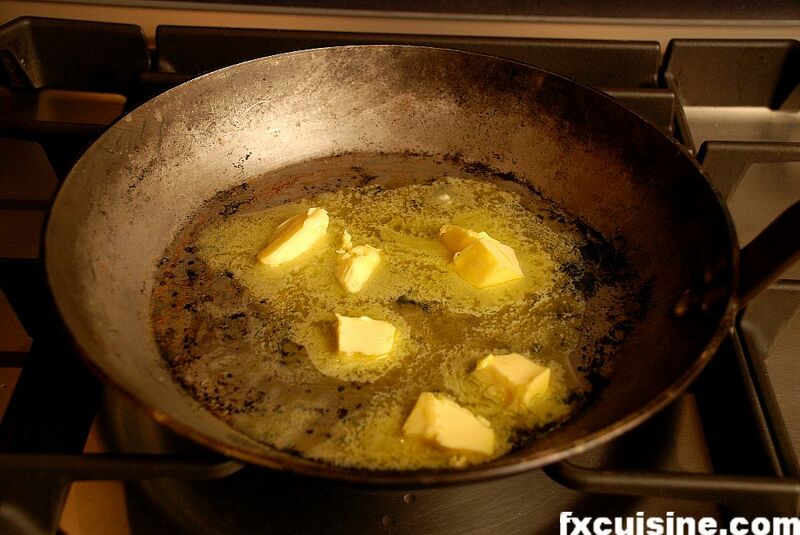 Melt 50gr butter in a heavy saucepan. 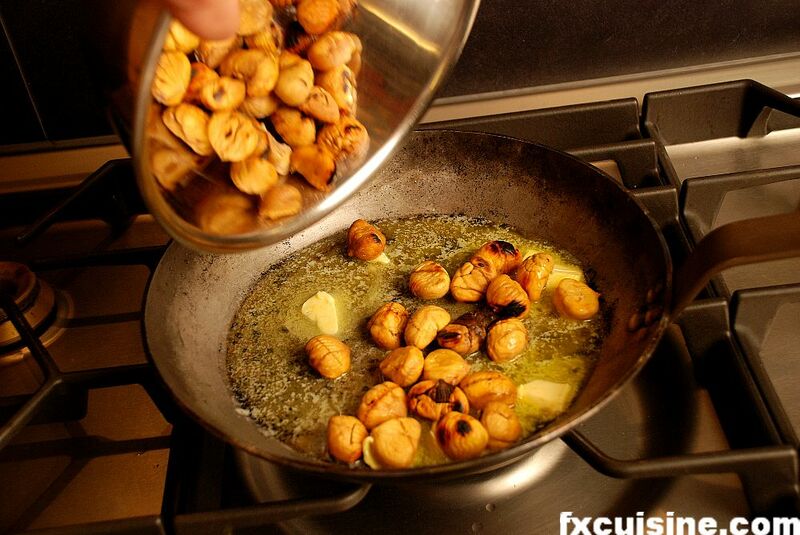 Add the chestnut, coat in butter. Add the sugar and mix well. Leave a few minutes on high heat. 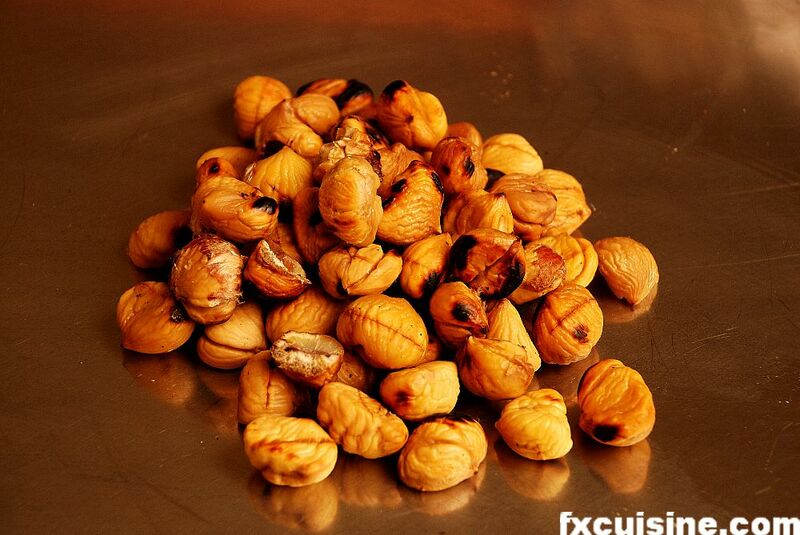 Remove from fire when either the chestnut have begun to brown slightly or the sugar is changing color. Chop 2/3 of the chestnuts roughly. Leave the rest for decoration. The crust is best made in advance. I wouldn't use a bought crust for such a special pie but that's me. Work the butter and egg together, scrape the inside of the vanilla pod and add. 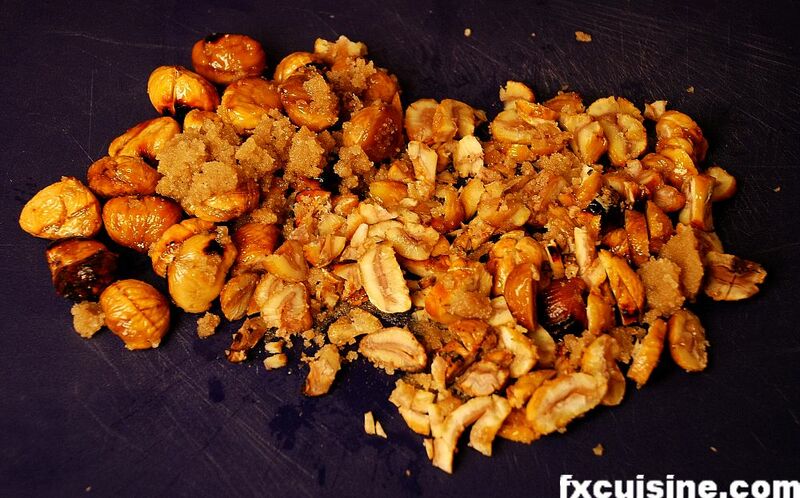 Then add one by one the sugar, ground almonds, salt and flour. 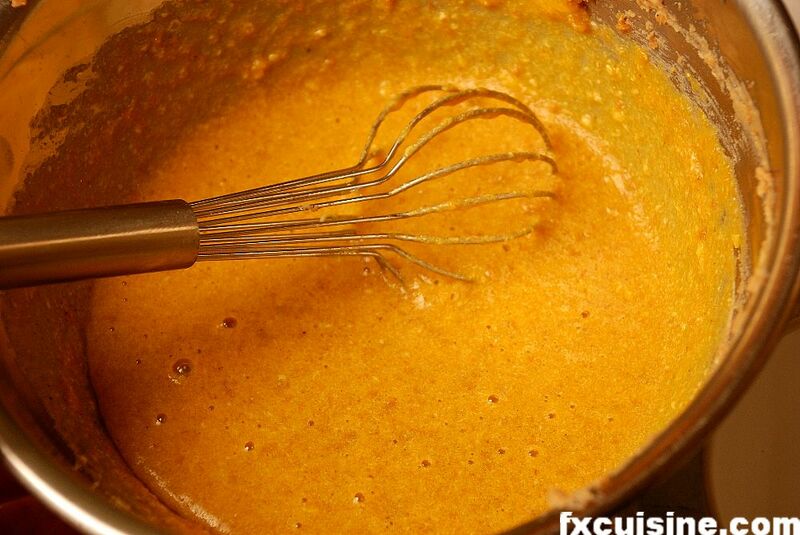 Work to a smooth paste and leave to rest in the fridge for 30 minutes. 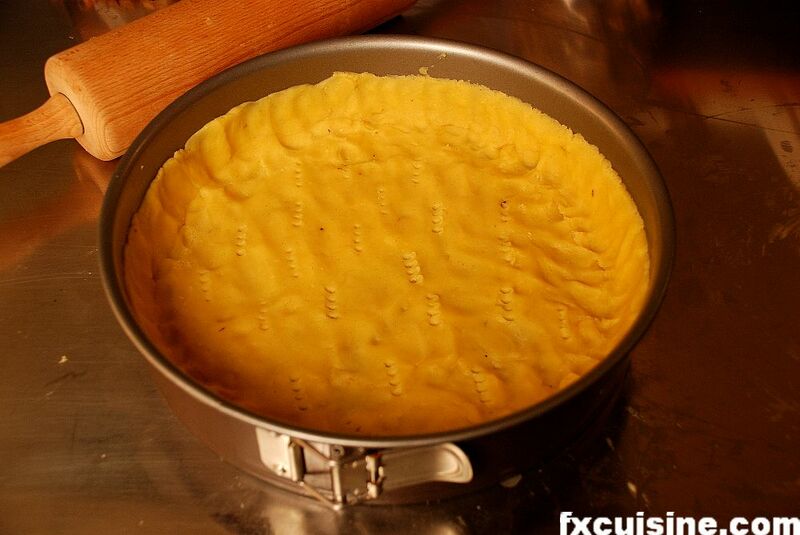 Then grease and flour a baking mold and carefully stretch the dough to cover the bottom and one each on the sides. You may need to patch holes with extra dough, it is a rather fragile but extremely tasty dough so it's worth the effort. 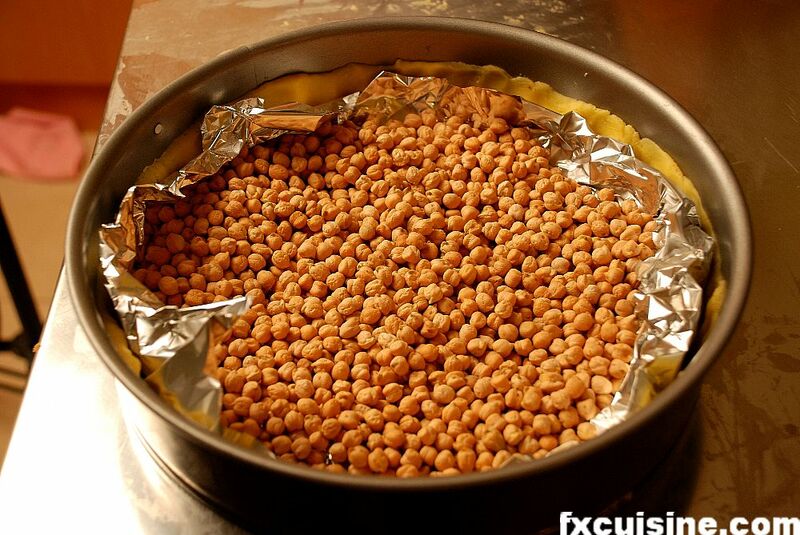 Cover the crust with tin foil and a layer of chickpeas or some other heat resistant denizens of your kitchen so that it will keep flat. Bake for 20 minutes @ 180C. 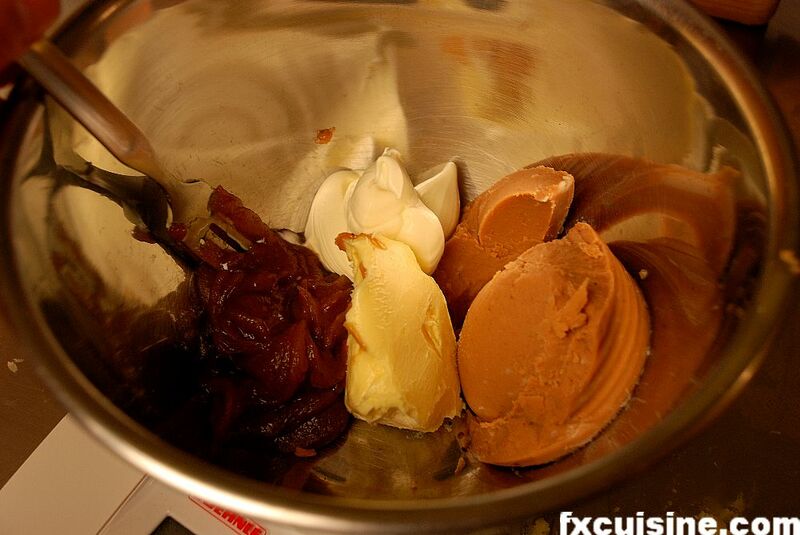 Make the filling by mixing the rest of the butter, the cream, the chestnut spread and the chestnut purée. 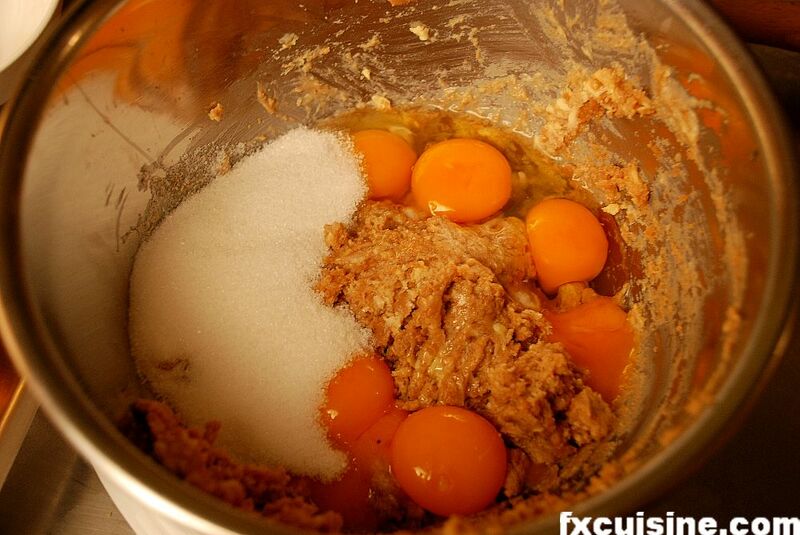 Mix well, then add the eggs and the rest of the sugar. Beat together until you have a smooth mixture. Heat the oven to 180C and assemble the pie. 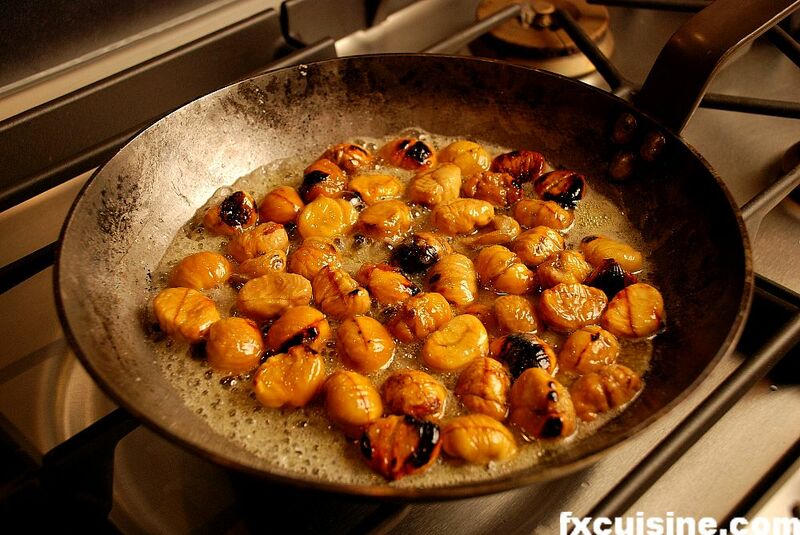 ... then add the liquid filling and garnish with the whole chestnuts. Bake for about 20 minutes @ 180C. 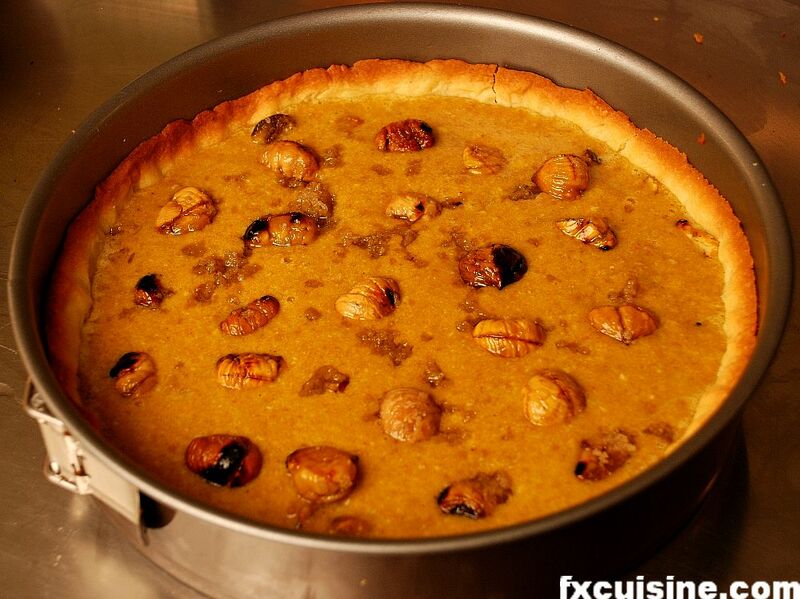 Release your pie with care from its mold and serve warm. Mmm looks magnificent. One question though, what brand of chestnut spread did you use? Because I can only think of Nutella, which is a hazelnut spread. 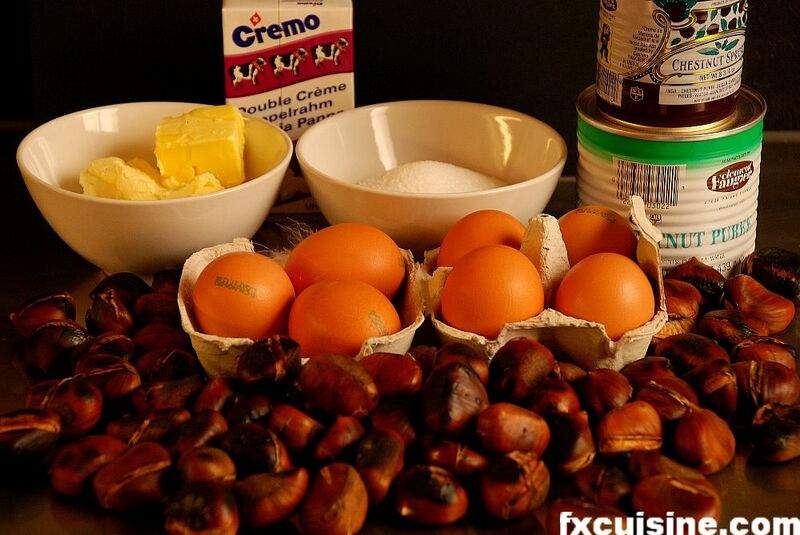 Any brand will do, but you need to make sure it is chestnut spread, made with chestnuts and sugar. Have a look at the picture to see what it looks like. If you can't find it, do some other recipe instead. 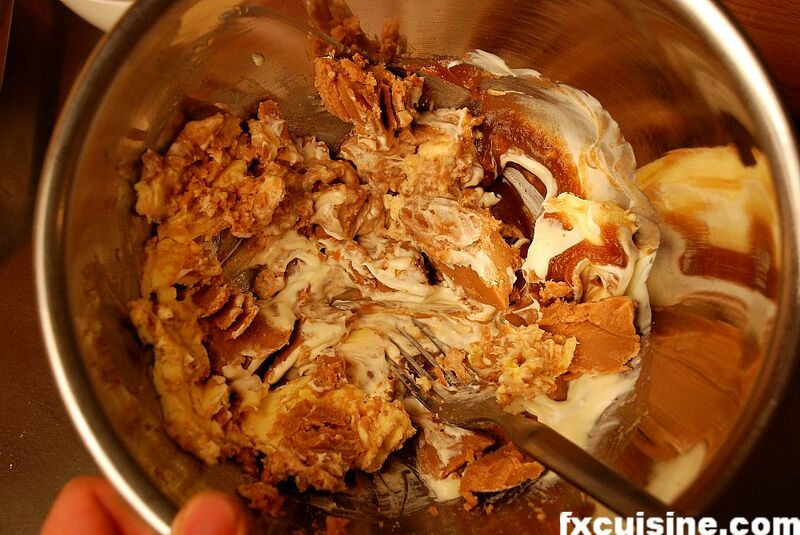 There are many fine recipes using Nutella too! There is a brand called Bonne Maman that has chestnut spread. It's really good says my friend from France. Hi FX, always a big fan of your site, I'm going to try this recipe soon. 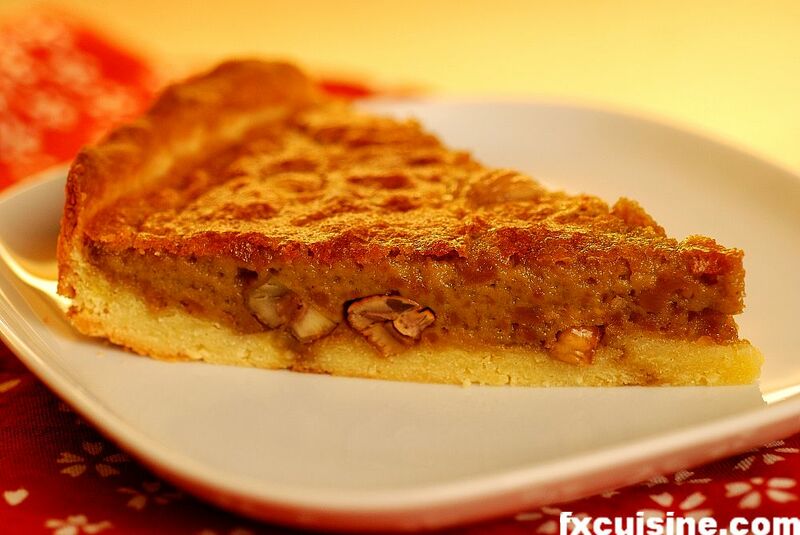 I have tried a few pie crust recipes. I like to use a fine feuilleté like the ones found in Ginette Mathiot's books (if you ever get a chance at looking up the 1932 edition, I'm sure you'd love the detail). 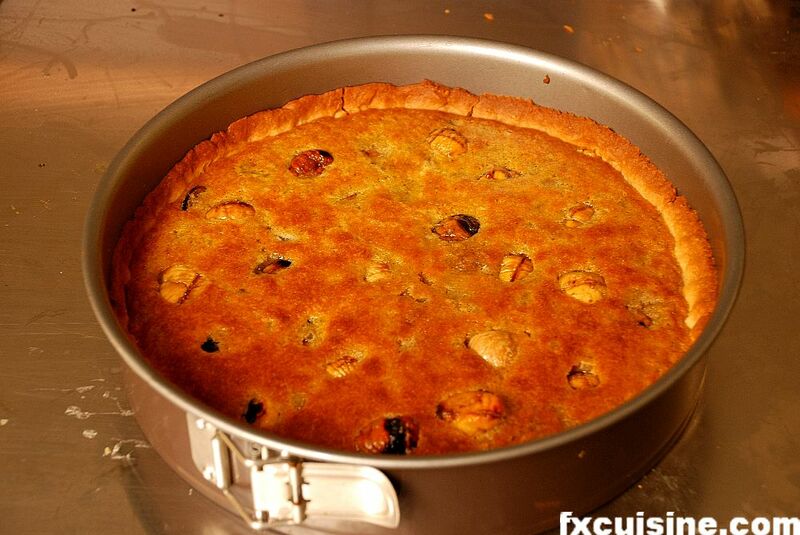 Is there any preferred pie crust recipe you could suggest? Ana Gabriela for this recipe I recommend you bake the empty shell with some stones in it before adding the filling, or the bottom won't bake (all the heat will be transferred to the filling). Good luck! Great sounding recipe but I don't have a scale so measuring in grams is out of the question. How about a cups/tsp./tbsp translation? Marcus, it's a great recipe 'tout court'. If you are serious about baking I really recommend you buy a gram scale, all professional pastry chefs use it even in the US. There is no telling how much in volume these ingredients will take unless we both use the exact same ingredients. Flour and sugar can take really different volume with the same weight. Hi FX! 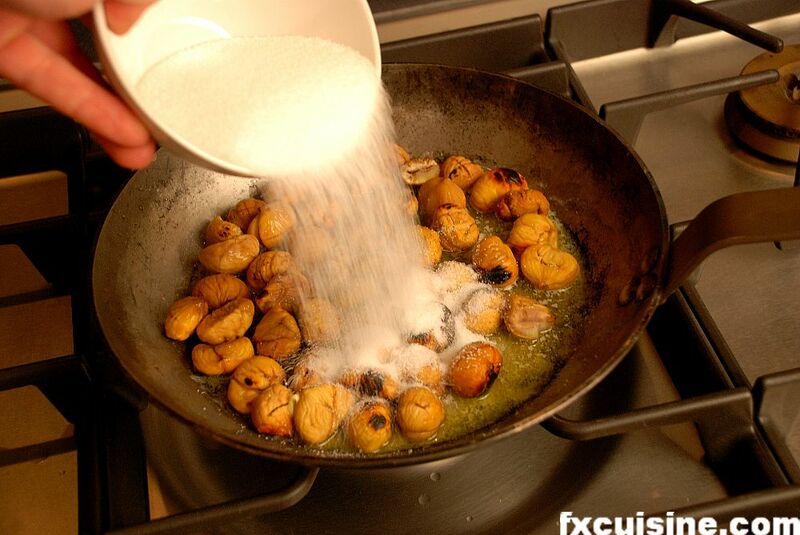 Could you please answer Pat's question about the proportion of the sugar that goes in the pan with the chestnuts and how much goes with the filling? I did not understand The amount of heavy cream. does it need to be whipped? Francois,I'm getting ready to try this again this year,but,like several other comments' I'm confused about the amount of sugar(s) in the filling.The error to me could actually be double the castor sugar-which I'm grinding myself in a common blendor. FX's answer→ I know have chestnut trees around me, this is a great idea to do it from the chestnut you collected yourself! Text-only version printed from http://FXcuisine.com/default.asp?Display=35 - visit the online version to see many gorgeous pictures of this recipe!